Alone. Desperate. Hopeless. Helpless. Hagar sat waiting to die. She had left her son Ishmael far enough away that she couldn’t hear his cries as he faced the pain of hunger and thirst. She could not see a way out of this one. Just days earlier they had been stripped of their place in Abraham’s family and sent away, with Ishmael being denied any inheritance he had. Though a slave, Hagar had a place of belonging in Abraham’s home, and a way to feed her child, but it was gone. She was a foreigner in an unknown place. She was a single mom as a result of an unplanned less that ideal pregnany in a desperate place. Her son, an orphan stripped of his inheritance. They were poor. They were hungry. They were thirsty. She saw no way out, so she waited to die. As moms we feel deeply when our children cry. It is impossible to ignore it. She knew this, she knew how much it would hurt to hear her son cry out in dehydration, knowing there was nothing she could do. So she walked away. What a desperate, hopeless place she was in. He heard the boy’s cry and provided a well. He provided hope when there was none. Why did God step in in such a miraculous way? Because Hagar mattered. Because Ishmael mattered. Was Ismael the child God promised to Abraham? No, Isaac was. In fact Ismael was the result of Sarah and Abraham trying to “help God” speed things along. Was Ismael significant in the birthline of Jesus? No, we never hear about Hagar and Ishmael again. Why did God go to such lengths to save Hagar and Ishmael? Beacuse they were made in the image of God. Because all lives have value. The unborn matters. The vulnerable mother matters. The immigrant wanting a better life in the United States matters. The child in foster care matters. The homeless man matters. The poor matter. All lives are worth fighting for. There has been so much noise in the Christian world this week, and for good cause. However, I have to ask, is all of our chatter going to change the mind of the lady that has already decided that if faced with an unwanted pregnancy, she will abort? Simply put, no. Our noise is not going to change the world. Our outrage is not going to change hearts. Change starts when we take action. It is time to step into the trenches and love the broken and show the world that follower of Christ really do value life. It is time to cook meals for the homeless. It is time to buy diapers for the single mom. It is time to open our homes to vulnerable children in foster care. It is time to stop fighting over a wall and think about those outside our borders that survive on less that $1 a day. It is time to support crisis pregnancy centers in every way that they need. It is time to be the hands and feet of Jesus. 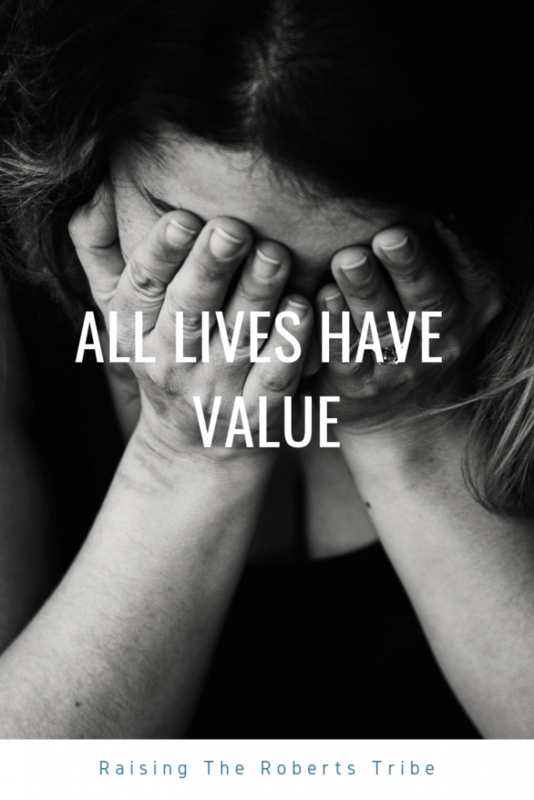 Let’s show the world that followers of Christ value every life, not with our chatter, but with our lives.